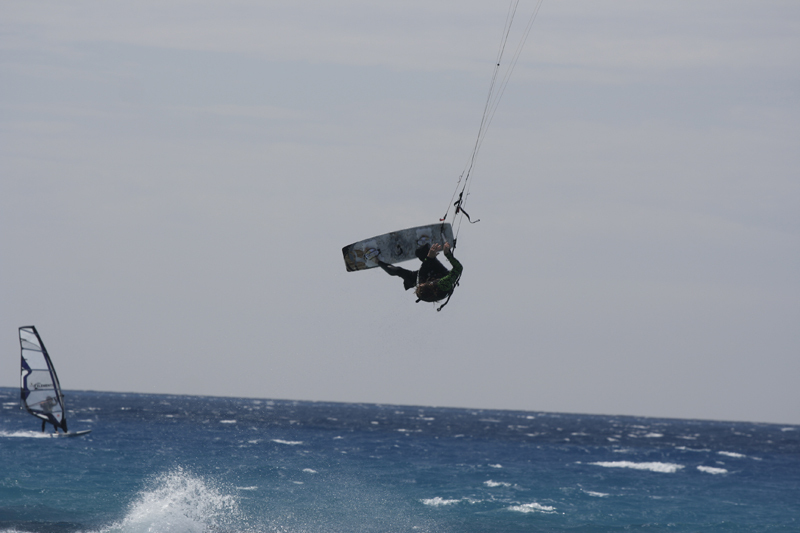 Soaring through the air, 40 ft off the water, carving up glassy smooth water in only 10 knots of wind, riding a perfect 8 ft break a mile off shore. 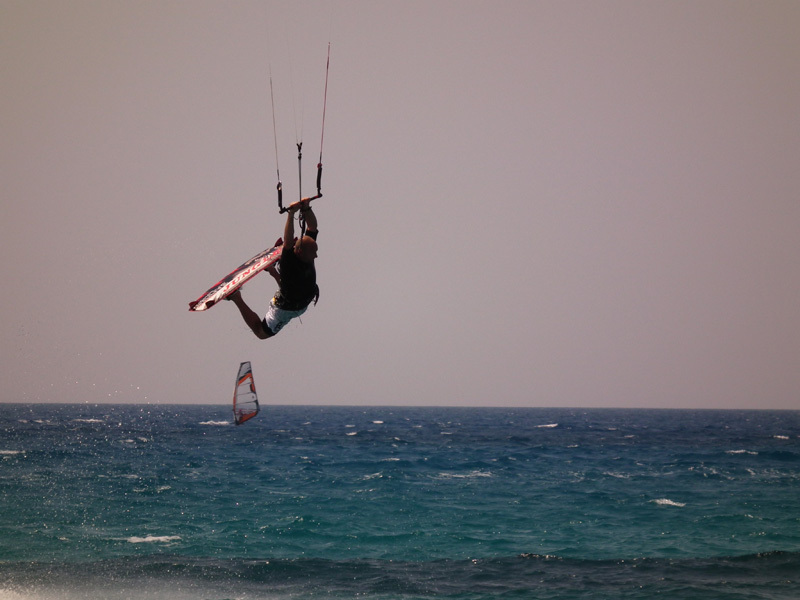 This is kiteboarding, and its popularity is surging throughout the world, with all types of people from all different backgrounds able to give it a go. 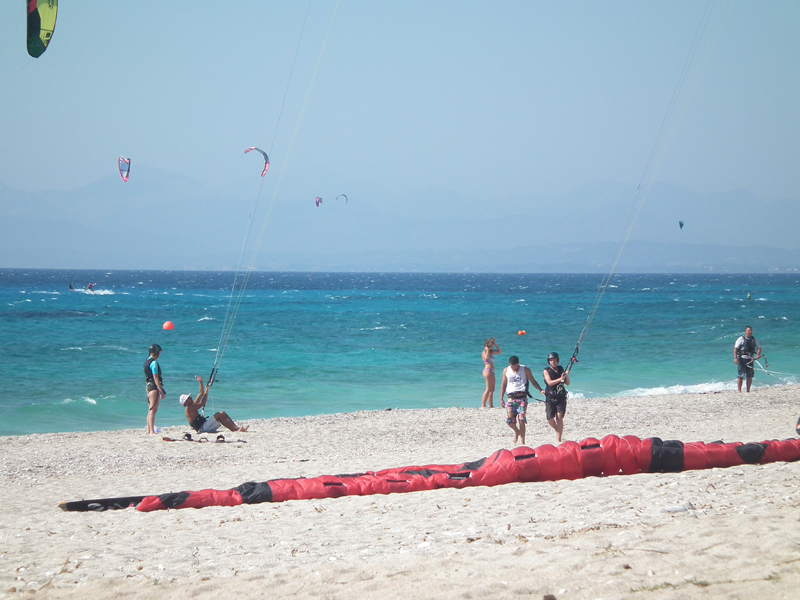 Kitespower offers a network of instructors for most locations in Greek waters. 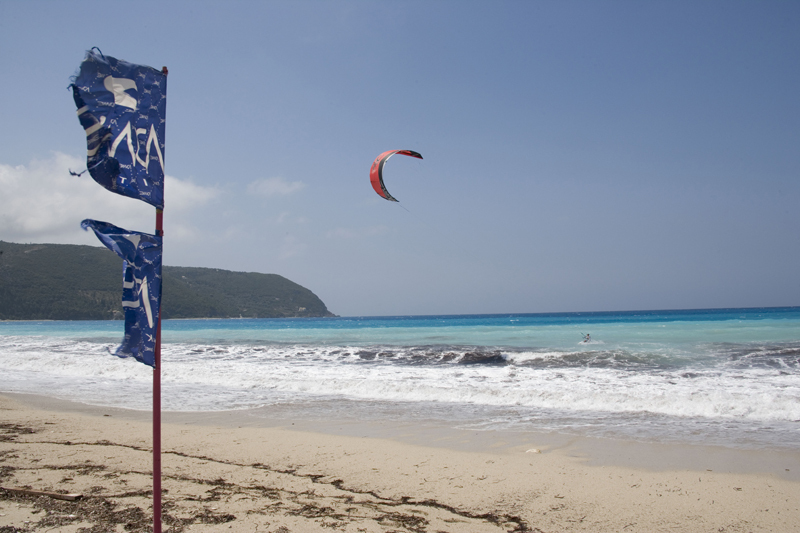 Only experienced instructors, or those approved by the IKA (international Kiteboarding Association) are used to give you the safest and highest quality instruction. Contact us for a lesson customized to suit your needs. 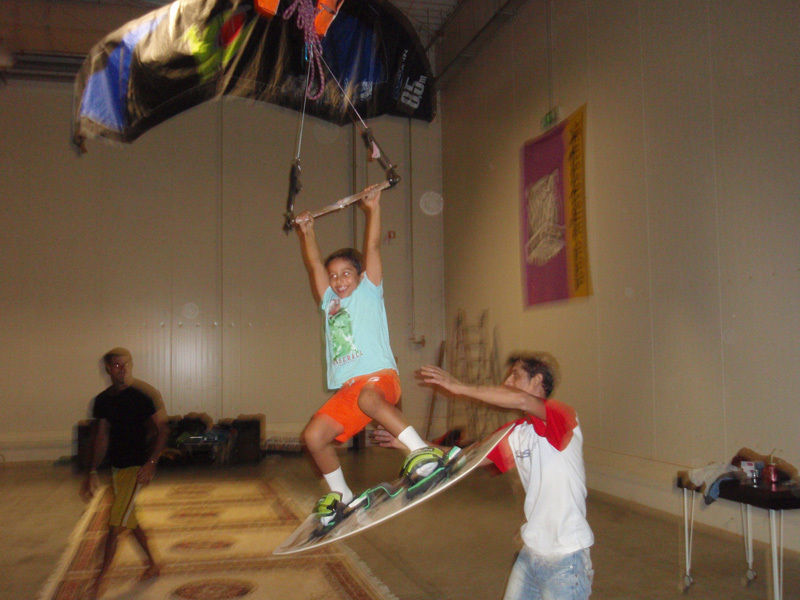 We use the latest kite equipment for your safety and to maximize your kiting experience. 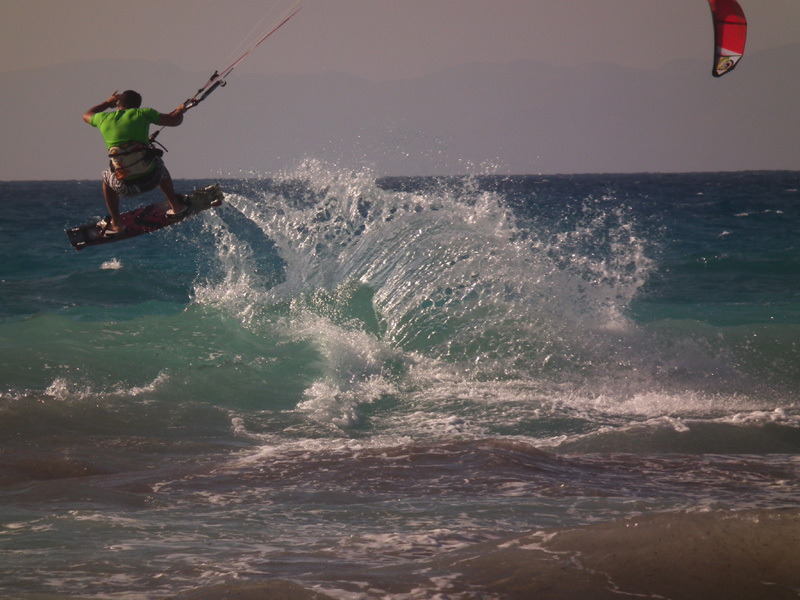 After all the statistics the last 20 years is proved that at MILOS BEACH from April till September there is every day 90 % constant wind, ideal for top level kitesurfing. 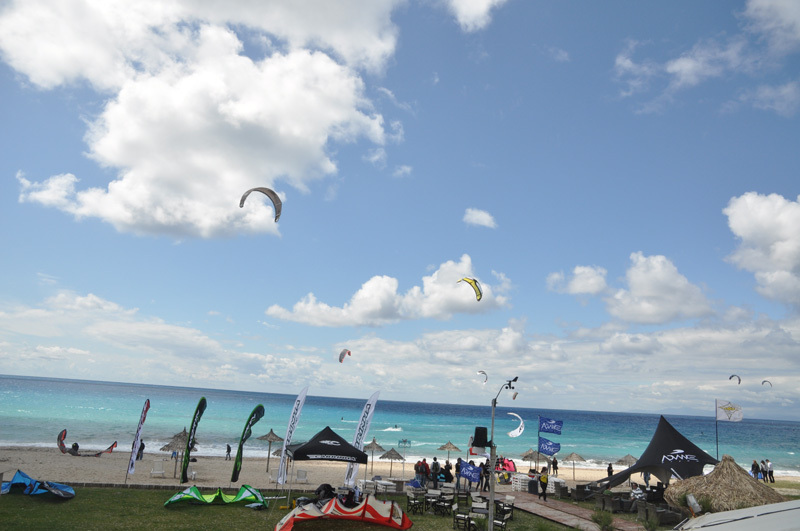 The super thermal stable wind (usual average 15-20 knots), which blows steadily at the summer time, is the best for beginners and advanced kitesurfers, since it starts every day to blow gradually from the noon till late in the afternoon with more intense. 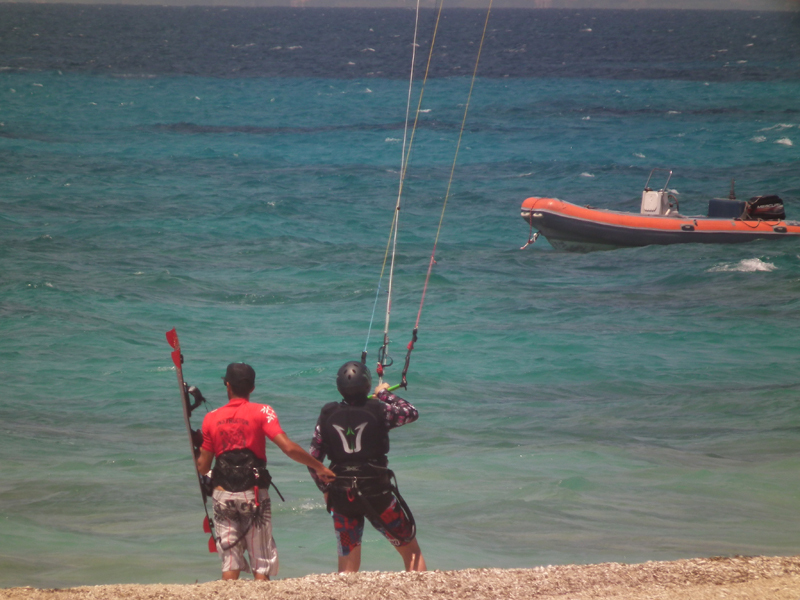 At Milos Beach and sea area, since the water is deep and the wind is side on, if someone wants to try the waterstart for the first time, he/she is better to be at least 60m away from the shore (double length of the kite lines). 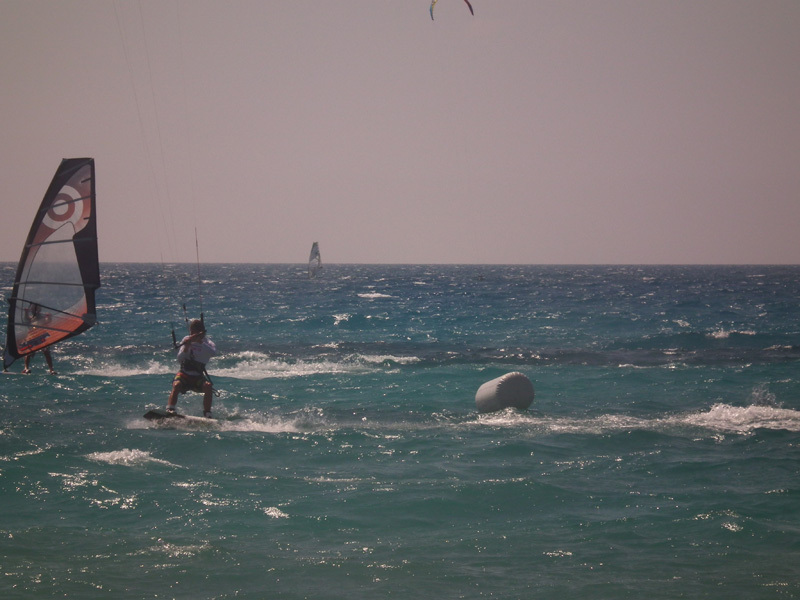 That's why the academy owns, besides everything else 3 coach inflatable motorboats (3,20m-4,20m-4,70m), so, when the students want to try the waterstart really far away from the shore without body dragging, WE ARE ABLE TO TRANSFER THEM WHEREVER THEY WANT IN THE SEA AREA BY BOATS. 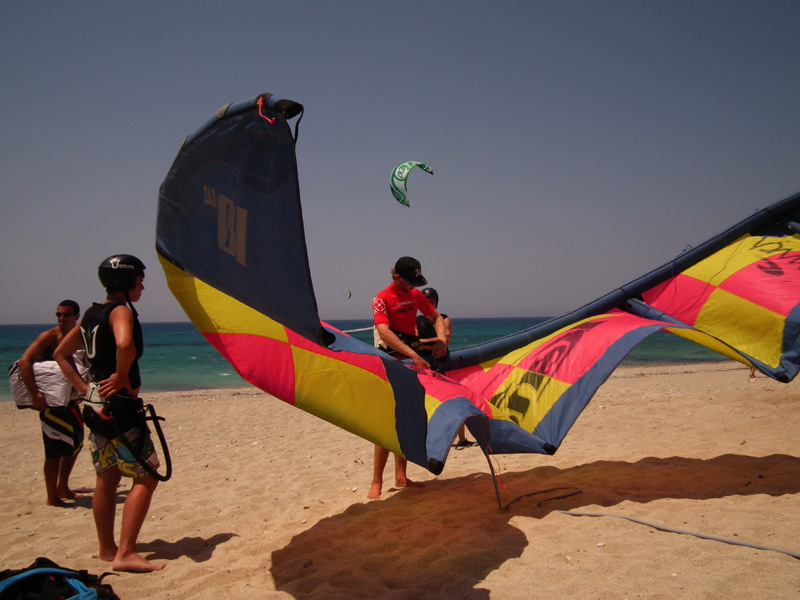 After all these years, the instructors have the necessary knowledge and the right equipment, for teaching kitesurfing absolutely safely, correctly and quickly. 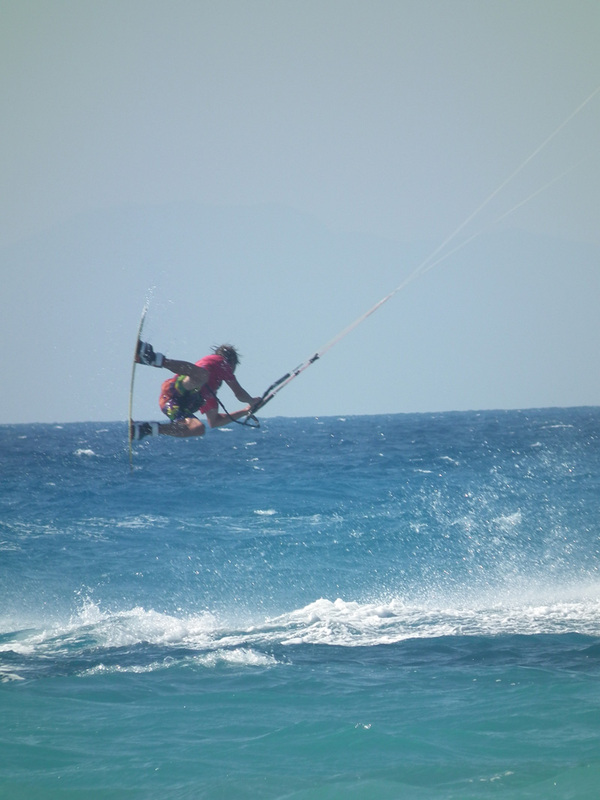 Days with strong northwest winds (22-27 knots) and when waves are coming at Milos Beach, there are a lot of shallow & flat water areas, near Milos Beach, perfect for kiters they don't like the waves. 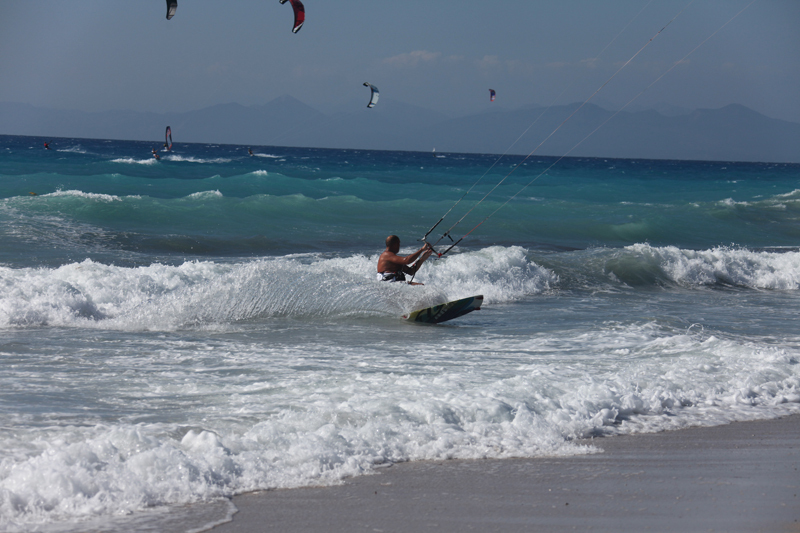 These days at these areas the wind is as strong as at Milos Beach and we are moving there for the beginner lessons by a 9-seats Mini Bus or a 7-seat off road Car or Boats. 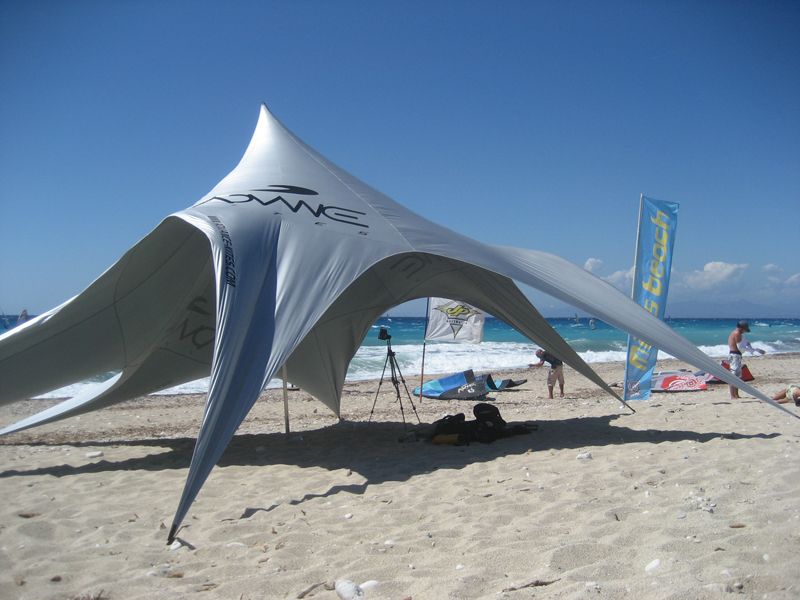 Of course we are able to move any day at the shallow water areas for lessons, if a student wants it, but, sincerely, the most of the times also the big size kites (14m, 15m, and 16m) are not flying well there, so the lesson is not successful. 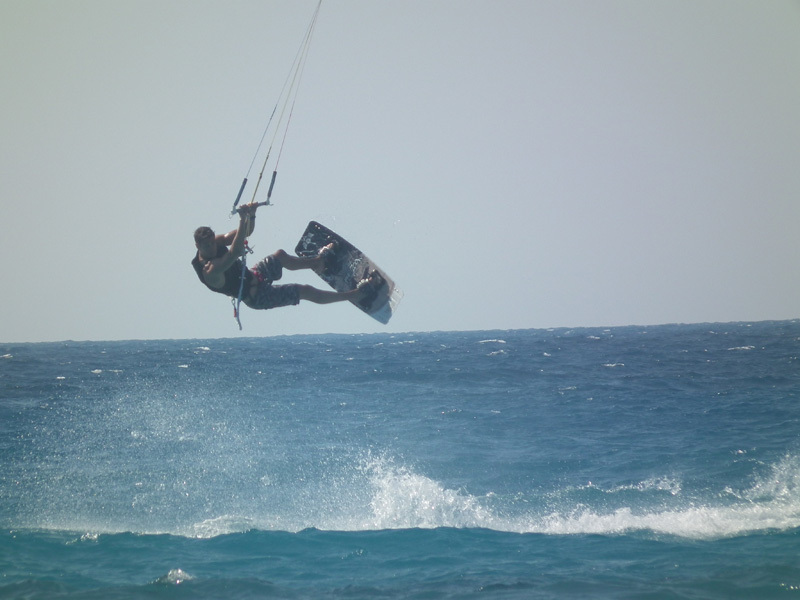 FOR CUSTOMERS THAT PREFER TO KITESURF ON THE WAVES, THE SCHOOL HAS AVAILABLE FOR LESSONS & RENTALS, BESIDES OTHER BOARDS, ALSO TWIN, THRUSTER AND QUAD KITESURF CUSTOM BOARDS. 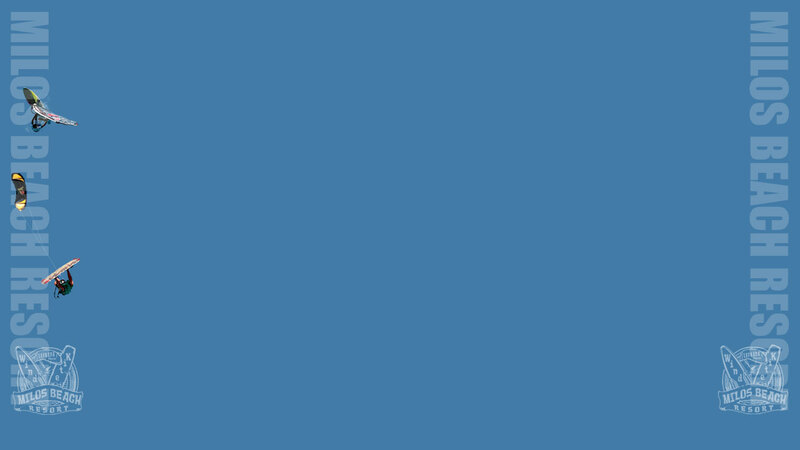 Participants must be physically fit enough for the sport and can swim pretty well. 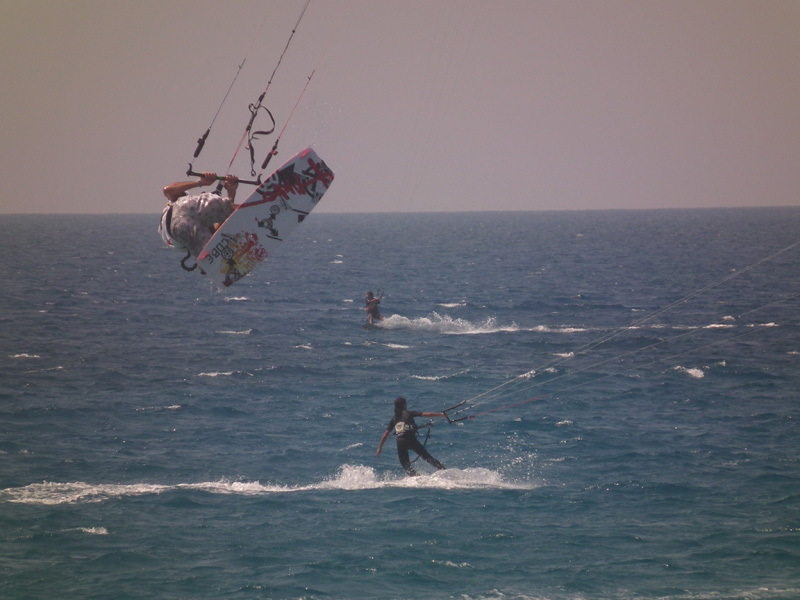 No other experience is necessary, although it helps to have a background in water sports and/or in kite flying. 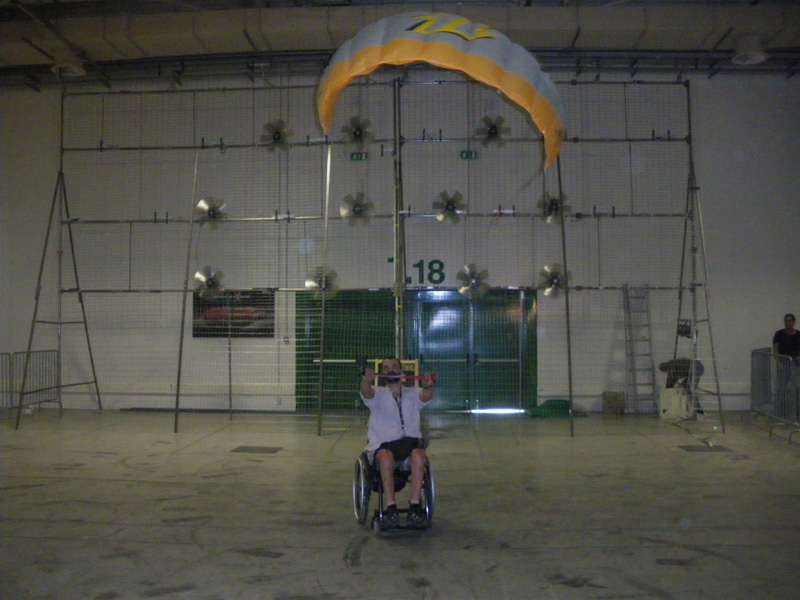 All of the kite groups have a maximum of 2 people in them. All the students, purchasing one of the school programs, are insured (according to our insurance policy). Third party liability against passengers and third party, up to 234776 euros, according to the law 3131/94 and the general terms, which are included, with the following maximum limits per accident: a) Death / Physical injuries, up to 146735 euros and b) Damage, up to 88041 euros.